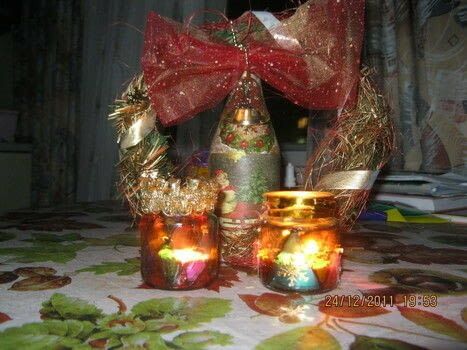 https://www.cutoutandkeep.net/projects/candlestick • Posted by Vera I. In fact you may use any paint you like, but that one invented specially for glass - transparent and colorful - is the best one. 1. Find a small baby-food jar with a large mouth, wide enough to put a floating candle inside. 2. Make a geometric drawing with a special bleck contour, applied to all transparent glass paints. 3. Let the contour dry for 30 minutes at least. 4. Fill up the spaces between black lines with different glass paints. Do it on one sede first and then let this side dry for at least 20 minutes and only then paint the other side of your jar - otherwise the paint will flow and dry up abruptly. Let the other sida dry for at least 20 minutes. 5. 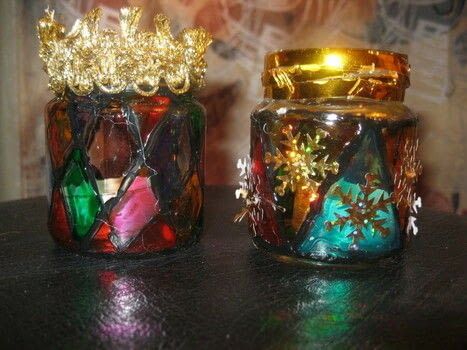 With a glue gun or with a simple fabric glue glue the foil decorations if needed and a gold ribbon to the upper edge of the jar. 6. 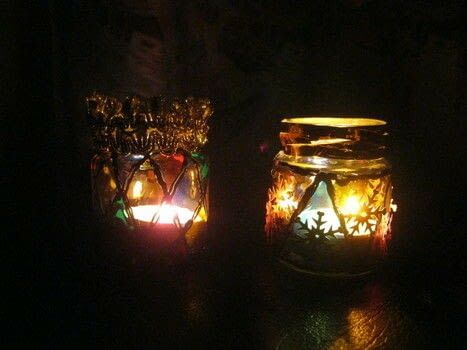 Put a floating candle inside the jar and light it. Now you have a very nice christmas candle holder!